Camp Guyasuta dates back to 1918 when it was donated by Mrs. Darlington, the great granddaughter of General O'Hara. This beautiful property consists of 129-acres located in O'Hara Township, PA, only six miles from downtown Pittsburgh. The best rules for camp are the Scout Oath and Scout Law paired with good common sense. To avoid misunderstanding, the following conditions also prevail. Thank you for your cooperation and have a GREAT CAMPOUT! Please have the courtesy to call the camp if you cancel your plans within two days of your arrival date. RESERVATIONS: Order and registration numbers will be issued with the completion of an online reservation. Reservations are confirmed only when a confirmation email has been issued from the online reservation system. All reservations are accepted on a first come basis. In the event of an emergency, the council reserves the right to cancel reservations with 24 hours’ notice. Unpaid reservations will be held for ten business days. 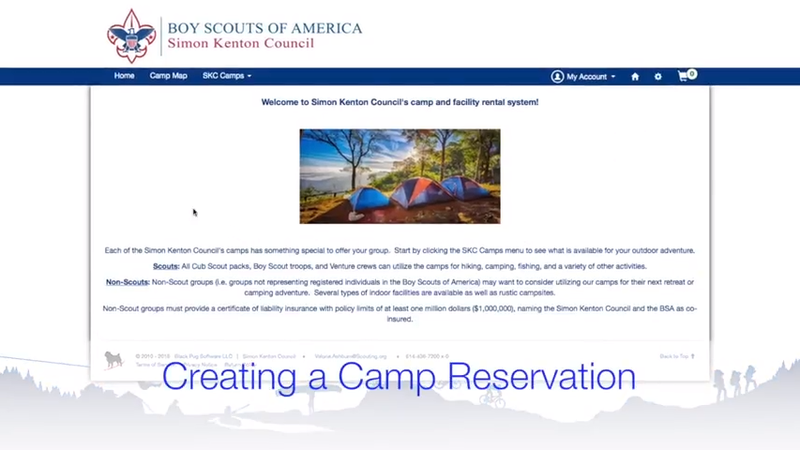 After 10 days, the reservation will be removed from the online system. Camp cannot be responsible for the loss or damage of group or personal items. CANCELLATIONS/REFUNDS: Refunds must be requested in writing at least 14 days before the reservation. Refunds requested within 14 days of the reservation will be issued at the discretion of the LHC Camping Department. Requests after the reservation date or for no-shows will not be considered. If it becomes necessary to close a facility due to inclement weather or another emergency, you will be notified and given an opportunity to reschedule. Do not assume that a camp is closed due to inclement weather. Refunds will be issued via check, less a 10% processing fee. Credit toward future events will not be given. ARRIVAL/DEPARTURE: Groups must check in and out of camp with the Camp Ranger or Campmaster. Check‑in time must be prior to 10:00 p.m. on Friday, but no earlier than 5:00 p.m. Check‑out time is no later than 11:00 a.m. Sunday for weekend camping trips. The group must remain in camp until properly checked out. . If your arrival will be after 9:00 p.m. please be courteous and call the Camp Ranger or Campmaster to let them know. For day and evening activities check out is not later than 10:00 p.m.
VEHICLES/PARKING: All vehicles are to be parked in assigned areas only. No vehicles are permitted past the camp parking lot without permission from the Camp Ranger or Campmaster. Carts to transport equipment from the parking lots to camping areas are available at Camps Guyasuta and Twin Echo. Roads must be kept open for travel at all times. Camp speed limit is 10 miles per hour. At no time is any person permitted to ride in the bed of a pick-up truck or trailer. OFF LIMITS: All buildings and related grounds are off limits unless authorized by your reservation. FIRES: Request the ranger's instruction on the number and location of fires. Fires must not be built up to dangerous or nuisance proportions and must be tended at all times. Low pressure gasoline stoves and lanterns using kerosene other fuels are dangerous and prohibited on all Laurel Highlands Council camp properties. Liquefied petroleum (LP) propane or butane lanterns or stoves are permitted only under adult supervision and control. The use of fuels for starting fires is prohibited. Please follow all posted rules for firewood usage. Firewood must be replenished for the next group. See the Camp Ranger or Campmaster for more information. NOTE: Only hard wood (maple, oak, birch and cherry) can be used in indoor fireplaces and stoves. Softwoods (pine, spruce, fir, cedar, poplar) must only be used outside due to the dangers of creosote buildup in the wood stoves and chimneys. CAMP ACTIVITY HOURS: Activity hours are between 7:00 a.m. and 10:00 p.m. At all other times, please confine your group to the limits of your campsite and be considerate of others. Do not enter other campsites without permission. CONSERVATION: Service projects to improve the environment are encouraged. 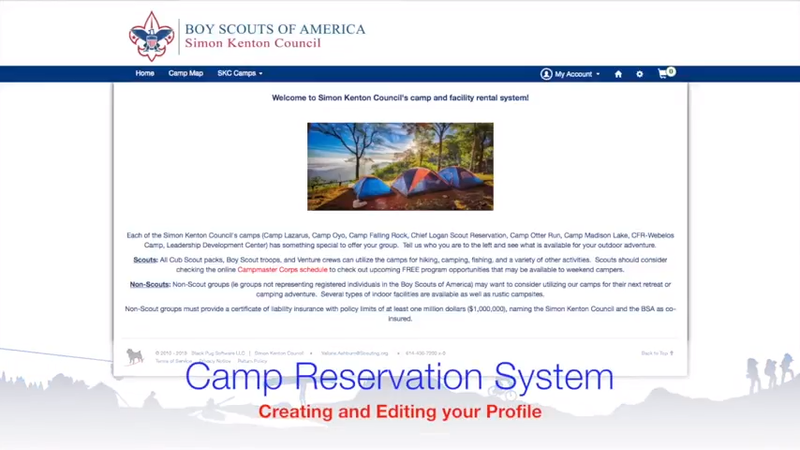 See the Camp Ranger or Campmaster for a project. The Outdoor Code should be in action at all times. Do not remove bark or fell any trees. The use of any wood tools must be supervised by a unit leader. The Camp Ranger or Campmaster may deny the use of any tool whenever their use is deemed unsafe. If any live trees are cut or damaged, the group responsible will be charged for its replacement at a cost of $50.00 each. CLEANING/TRASH DISPOSAL: A Scout leaves a place cleaner than they found it. If staying in a cabin, please clean and remove trash before checking out. Trash should be placed in proper receptacles or taken out of camp when leaving. If cleaning supplies are needed, please see the Ranger or Campmaster. Practice Leave No Trace principles in campsites. SANITATION: Groups will be assigned a latrine and are responsible for its proper use. No other method of human waste disposal is permitted. Food preparation or dishwashing is never permitted at or near latrine washing areas. These activities should only be performed in your campsite. Drinking water must only be obtained from certified camp taps and never from springs and streams. ACCIDENTS: Report all accidents, fires, or property damage to the Camp Ranger or Campmaster immediately. Be prepared to provide a written incident report. Observe the location of first aid and fire equipment and be prepared to cooperate with the Camp Ranger or Campmaster if requested. Use of physician or hospital is at the expense of the unit requesting such treatment. The unit or group must arrange transportation of injured person. Groups will be charged the repair or replacement cost of any vandalized item. FIREARMS: The use of firearms, archery equipment, gas guns, and air guns are prohibited except with approval of the Council Camping Committee and Shooting Sports Committee as part of approved programs. PROHIBITED ON CAMP PROPERTY: Alcoholic beverages, illegal substances, firearms, fireworks, chainsaws, dogs, cats, other pets except for certified service animals, floating devices, and activities not consistent with the Scout Oath and Law are not permitted. FISHING: Where applicable, fishing is permitted except in swimming areas. No live minnows may be used as bait. Make sure that Pennsylvania fishing regulations are followed. LEADERSHIP: All camping trips must be led by a minimum of two adult leaders, one who must be at least 21 years of age with a second leader who must be at least 18 years of age. Pack camping and Webelos Den overnighters must be under the leadership of BALOO trained adults in accordance with BSA Cub Scout camping policies. All BSA policies and guidelines contained in the Guide to Safe Scouting, Scouter Code of Conduct, Age-Appropriate Guidelines, and other BSA publications must be followed at all times. BICYCLES: Bicycles are prohibited, except Camp Seph Mack or with approval of the Council Camping Committee. SWIMMING: Swimming is prohibited, except with approval of the Council Camping Committee and Aquatics Committee. SMOKING: An important way adult leaders can model healthy living is by following the policies on alcohol, tobacco, and drugs. Leaders should support the attitude that they, as well as youths, are better off without tobacco in any form and may not allow the use of tobacco products at any BSA activity involving youth participants. This includes the use of electronic cigarettes, personal vaporizers, or electronic nicotine delivery systems that simulate tobacco smoking. All Scouting functions, meetings, and activities should be conducted on a smoke-free basis, with smoking areas located away from all participants. Smoking is not permitted in any building or under any structure such as pavilions, including temporary structures such as tents or tarps. BUILDING CAPACITIES: Building capacities are set by the local Board of Health and/or Fire Marshall and are not to be exceeded under any circumstances. Groups that exceed the listed building capacity must tent overflow campers outside, or rent additional facilities. Smoke and Carbon Monoxide detectors are installed for your safety. It is both illegal and extremely dangerous to tamper with or disable them. Violators may lose camping privileges- please tell Camp Ranger or Campmaster if you have a malfunctioning alarm. INFRACTIONS: The Laurel Highlands Council Executive Board has designated the Camp Ranger or designee as authority for dealing with any rule infractions. If immediate safety of others is put in jeopardy, groups may be immediately expelled and no refund will be issued. For serious or repeated infractions, such as not following proper check out procedures, the Laurel Highlands Council may deny the use of the camps to a group. If common laws are broken, local police may be notified. Refunds must be requested in writing at least 14 days before the event. Refunds requested within 14 days of the event will be issued at the discretion of the LHC Camping Department. Requests after the event or for no-shows will not be considered. Refunds will be issued via check, less a 10% processing fee. Credit toward future events will not be given. A Scout leaves a place cleaner than they found it. If staying in a cabin, please clean and remove trash before checking out. If cleaning supplies are needed, please see the Ranger or Campmaster. Practice Leave No Trace principles in campsites.